Tickets for the show are $10 and can be purchased on our website or after service on Sundays. Artists Amy Ferebee and Regina Scott Sanford will perform in our CVUU sanctuary. Amy and Regina have appeared together on many occasions. 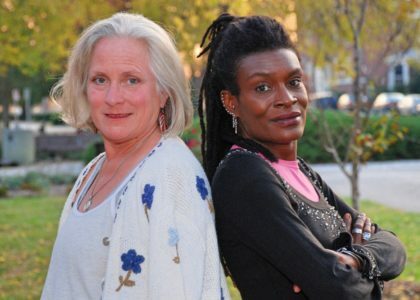 Notably and as commissioned by the Women’s Department of Tidewater Community College, Amy and Regina created and performed a two-woman historical show called “Shackles and Chains and Ties That Bind” featuring the abolitionists Angelina Grimke and Frances Ellen Watkins Harper. A Norfolk native, Amy Ferebee is well known locally and regionally as a guitarist and vocalist. For forty-five years, she has honed her unique musical skills, delighting audiences from D.C. to Dallas and entertaining widely in the Mid-Atlantic Region with her impressive guitar work and soothing vocals. Her repertoire is an eclectic mix of contemporary and traditional styles including flat-picked fiddle tunes, finger-style blues and jazz. As the featured songwriter Amy played a concert of all original songs in a sold-out performance at Zeider’s Dream Theater in February 2017. Hamptons Roads native, Regina Scott Sanford uses her experience as an actor, singer/songwriter and spoken word artist to create inspiring and uplifting multimedia performances. She was a member of The Hampton Roads Juneteenth Players for many years and a contributing writer and cast member of The Venue on 35th St.’s production of “Raising Hope, Raising Awareness.” Her poetry has been featured on John Sinclair’s Radio Free Amsterdam podcast and she was a member of the Om Shanti Rising Performance Collective. She has performed solo at numerous area benefit shows and often has been a featured singer and percussionist with Amy Ferebee.